Opening Reception Saturday, April 17th 2010 6 to 9 PM Gallery is open Saturdays 12 PM to 4 PM and by appointment. Mount Airy Contemporary Artists Space is pleased to present Brooklyn On Paper, an exhibition curated by Larry Walczak. Every day in our culture paper becomes less important. Since the so-called 'computer revolution' of the mid-1990's it has become less and less a necessity for today's society. "Hard copies" take up space in the business world. New media runs rampant at art schools and art galleries. However in much of the contemporary art world the joy of paper still prevails. Historically, drawings or sketches on paper were thought to be just that, merely sketches for a bigger more ambitious artwork on canvas. But with drawings, prints, and the advent of photography in the 19th century art-on-paper has gotten its share of attention. Visual artists love the casual, quickness of working on paper. They often feel unburdened by the pressure of creating an important piece while working in their respective direction. The intimacy of working with paper can produce a variety of results and this exhibition aims to offer a quick peek at the work of ten Brooklyn-based artists who have a special affection for working on and with paper. Thomas Broadbent produces lush watercolors of everyday objects in intriguing formations. 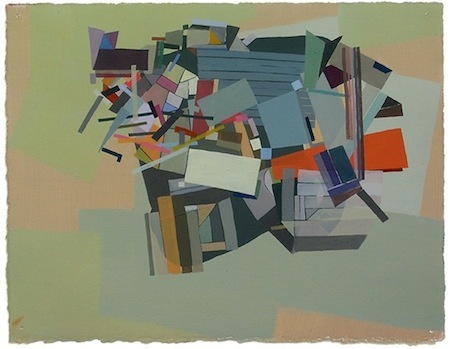 In "Saving Your Place #2" he prefers creating a still life in a geometric pattern of color and form. He desires overriding metaphors of the incomplete nature of things, the quest for knowledge or information in analogue form. He begs the question: are paper books becoming obsolescent. Larry Walczak is fascinated by alternative photographic imagery on paper and with his "Cell Structure" piece he copies directly on panels of bristol board to create his wall installation. No darkroom necessary as he utilizes two color copy machines to acheive the illusion of a massive cell structure innertwined from panel to panel. This unique print was the result of "old technology" as it was produced with a Hewitt Packer color copier and even older Canon personal copier. David Kramer has found success with his auto-biographical insights on paper. Kramer has created diary-like, confessional and witty image/text pieces for years. They sometimes resemble ads but always with a personal humorous observation involving his struggles with modern living and ins and outs of his dealings in the contemporary art world. Bob Seng has been working with EXIT signs for years. He degrades and reconstructs store bought silk screened EXIT signs by very precisely scraping (exiting) the various layers of ink to release the light and color from inside the sign and at the same time creating a new EXIT space to escape into or away from. Peter Fox plays with paint like it was taffy. His drawing was created by catching excess paint from his painting process with a palette knife and throwing it directly onto paper. He sees it as a way of transforming something simple into something complex. The result is a beautiful splatter of seductive colors that appear as if they could be peeled right off their paper surface. Brent Ridge's "Heaven is Hell" uses opposite color connotations. These forms use the earthly and heavenly against themselves to invert our common perception of colors and what their associations mean. Combining the "spray" of modern processes and the "purity" of untouched material to create forms symbolic of the self and our relationship as a viewer to the art, this piece makes a plea of appeal to our common fragility in the face of overwhelming forces. Edward Monovich's suburban landscapes reinterpret idyllic representations in advertising and children's stories. Drawings investigate relationships between privilege and suffering. Brand names and bling, worn by the figures, propagate a mesmerizing cycle of fashion and consumption and an artificial sense of progress. Pastoral landscapes are tainted by the presence of lottery tickets, hi-tech detritus, and illusions to geo-political crises, reminding viewers things are not what they seem. Mark Masyga's abstract painting on paper has been informed by both the physical appearance and the temporal nature of the built environment. This includes construction sites, deteriorating war bunkers, detritus left from earthquakes and wild fires. Masyga also finds comfort in humble materials (i.e. concrete, rebar, lumber) and has been exploring their physical, sociological and political uses. Besides his abstracted works on paper and canvas he has photographed countless construction sites in the NYC area. Linda Ganjian's paper tower is just that, a sculpture made entirely of paper. Each tower is comprised of forms that are derived from extinct alphabets. Ganjian traces and makes templates of the letters and then accumulates and starts arranging the individual paper pieces to create multi-leveled landscapes. She sees it as a way of interpreting the type architecturally, creating physical environments that exploit the beauty and intricacy of each letters formal qualities, whether geometric or calligraphic. Ganjian creates artwork ON paper and sculptures OF paper. Daniel Rosenbaum's drawing "Beehive" was completed on mylar with both pencil and oil stick. This piece is from a series of drawings which were created directly on tracings of topographical maps of superfund sites. Rosenbaum feels that "vegetable, animal and mineral form a new hybrid that is simultaneously decaying from a toxic brew".